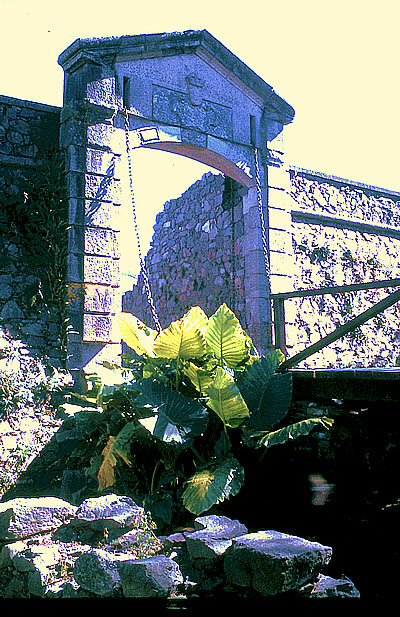 The last remaining city gate recalls the town's founding by the Portuguese in 1680. In the mornings we sit over croissant-like media lunas, spread with jam or dulce de leche, sipping cappuccino and watching the river flow from the rooftop terrace of our tiny hotel. In front of our perch, the peninsula bends in a half moon (mimicking thosemedia lunas) and spreads itself off into the distance in a long curve of beach that leads out of town. The day beckons in half a dozen possible activities… But we have no desire to rush. We are on the coast of Uruguay, in the southern cone of South America, and between the quiet elegance of our surroundings and the shockingly cheap prices, we’re wondering why it took us so long to discover this spot. Aside from the porteños (as the inhabitants of Buenos Aires are known) across the Rio de la Plata, it seems that few outsiders know Colonia del Sacramento, the 17th century jewel of a town that sits on this little peninsula. Rio de la Plata is called the widest river in the world but, truly, it’s more like a bay leading out into the South Atlantic Ocean. It took us three hours to cross it on the ferry our first day here. On later trips, we used a high-speed catamaran that made the journey in an hour but, even so, the feel is closer to being on one of the Great Lakes than any sort of river. Colonia is a former Portuguese smuggling port that was originally built to counteract—and supply—Buenos Aires. But with the founding of Uruguay’s capital, Montevideo, and Uruguay’s independence from Brazil in the 1820s, Colonia had outlived its usefulness and been left to drowse on the riverbank. The town is mostly cobble-stoned streets, with sycamore trees lining each one. Much of the center lies in the extensive Barrio Historico, with antique cars and sidewalk cafes spilling life along the plazas and passageways. None of the buildings are large, but many feature Portuguese and Spanish colonial details and the overall effect retains the pace of the past. Compared to Buenos Aires’ hurtling masses of traffic, Colonia has just the occasional car or motorbike putt-putting slowly along, stopping any time a pedestrian gets near a curb. The garbage collectors all use horse carts, and work throughout the day, so the cobbles ring with the sound of horses’ hooves. Cut-stone streets, antique cars, and al fresco dining: Colonia’s essential elements combine. We stayed at a friendly little posada on a cobbled street half a block from the river vistas and a quiet beach. Prices were so cheap in Uruguay that, for the first time on our travels, we could assure our two boys of having their own room at every stop. We paid $5-8/person in double rooms with private bath, TV. Heat/air con, and breakfast included. We spotted a little side street restaurant boasting “full parilla” for less than $5 per person, so we boldly decided to try it right away. When I confidently ordered “parilla for 4,” the restaurant owner’s eyelids lowered slightly. Very politely (always in Spanish; very rarely did we encounter anybody who spoke English at all), he promised that he would be happy to cook as much meat of whatever types we wanted... But did we truly want the full parilla? Well, he said, did we want the grilled steak? Oh, yes. And probably the sausage too? Certainly. The blood pudding? Hmm, I guess not. Kidneys? Stuffed intestine? And so on, as we realized we weren’t nearly the carnivores we’d imagined. In the end, he brought us heaping plates of sausage stuffed with chunks of oozing fat and slabs of meat that appeared to have simply been hacked off the bone with a cleaver. We’d heard that the pampas steaks were supposed to be the best in the world, but these were tough and chewy and, quite frankly, a real pain to try to eat. We did our best, but we all gave up well before we got close to finishing. I can still see the look of disappointment on the owner’s face as we left. But that was our only culinary misstep. Eating was cheap and delicious and tinged with the flavors of the many Italian immigrants to the country. Thick, tasty pizzas, delicately soft ice cream in exotic flavors, a simple milanesa (breaded veal) orchivito (steak sandwich) for lunch, lingering dinners with local Tannat wine… All at a fraction of European prices. And at another restaurant, where they kept a band saw alongside their parilla grill in order to reduce a side of beef to plate-sized forms, we had huge tenderloins that were buttery and soft and juicily tender to the taste. Full dinner and drinks? Less than $5 each. Aside from all the eating, we had a wonderful time just wandering the town. We went to a series of tiny museums, all of which could be entered using the same ticket. Some were essentially the interiors of homes from different periods (e.g. Museo Portugues and Museo Espanol). The Museo Municipal featured the history of the town, complete with scale model of the peninsula from the Portuguese period. The smallest museum was in a tiny tile-roofed stone house and featured nothing but azure decorative tiles. Many of the museum buildings encircle the ancient Plaza Mayor, a pleasantly shaded green space with drowsing dogs and bright parrots rustling in the trees. 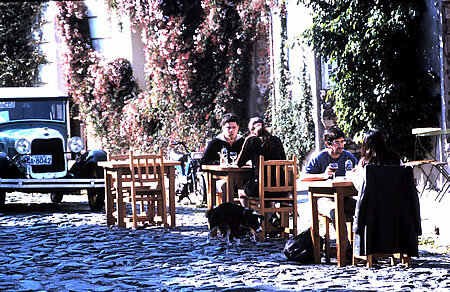 There are outdoor cafes with wooden benches and a handful of antique and artisan shops trailing down the side streets. For a fuller artisan market, visit the Feria Artisanal, which is open most days from 10 a.m. - 7 p.m., and is tucked along the northern edge of the peninsula between the main city park and the river. We wandered the winding riverfront Paseo de San Gabriel out to the southwest point to watch the sunset. This was also where all the teenagers gathered: sitting on the seafront wall, passing gourds of the ever-popular yerba mate tea around their groups, watching the lucky few rev their motorbikes and squeal along the cobbles. A fun spot to watch the locals plot their evening activities. Best was after dark. Night walking is one of my wife Judith’s keenest joys when we travel, and Colonia was ideal for it. A soft wind blowing in off the big river and curling up through the tiny lanes; candles glowing in the dimly-lit restaurants and cafes of the old town; the lighthouse and the double church steeples high overhead; near silence except for the occasional footfall on the cobbles. Most days were sunny and crisp, as the end of the Southern winter turned to spring. On one of them we climbed to the top of the lighthouse, which rises above the town from inside the walls of a ruined convent just off the Plaza Mayor. The whole of Colonia’s tiny peninsula lay below, while the vast river churned past on three sides, heading for the sea. We concocted plots and imagined histories of the townsfolk walking past beneath our perch and dreamed ourselves along those same winding streets. On another day, I rented a rickety bike and headed for the coastal road out of town. The views were beautiful, though windswept. Beaches started right on the edge of town, lined in spots by trees and the occasional grazing horse. I rode a few kilometers out to a monumental entertainment complex called Real de San Carlos that had been built in the early 20th century to include a massive bullring, a hippodrome for horse racing, and a fronton for pelota or jai alai. It was a megalomaniacal concept that failed. Today, the buildings still stand, but empty and crumbling, like the dreams they once held. On the way back, I found a quiet bench overlooking the vast sprawl of river and let the winds wash over me. With the empty Rio de la Plata before me, and a $3 tenderloin dinner waiting, this was one of those moments when location is sufficient for ecstasy. On the last night in Colonia, that same travel ecstasy crept back in. Because the weather had turned blustery and overcast, all other visitors had taken the boat back over to Buenos Aires. There were no young folks cuddling on the sea wall; restaurants were reduced to empty, candle-lit rooms or closed altogether. It was great: a moody night with the wind whipping up the narrow streets, the occasional twinkling light in a window and the sweep of the lighthouse beam against the sky. Magic. Already I was feeling nostalgic for the old cobbles and the whistle of the wind in the sycamores. Getting There: From Buenos Aires, Buquebus, and Ferrylineas run several ferries each day. Full information on all ferries can be found at www.buquebus.com. The cheaper, slower boats take nearly 3 hours. High speed catamarans make the crossing in less than an hour. From Montevideo, Uruguay, buses make the 2-3 hour journey continually day and night. Scores of companies can be found at the clean, modern Tres Cruces bus terminal east of the city center. Transportation: Colonia is small enough to explore on foot. Bicycles, motor scooters, and shaded golf cart buggies are available for rent at Thrifty Rental on Avenida General Flores near the seawall. Buses also run down General Flores heading for Real de San Carlos (every 30 minutes; blue bus) and Playa Ferrando (every 2 hours), which is the best nearby beach. Accommodations: For budget lodgings try Posada Casa los Pinos, tucked away on a side street near the river. La Posada del Gobernadoroffers a colonial setting. If you’re in the mood to splurge, Casa Real Barrio Historico provides the full antique colonial experience. All hotels’ prices increase on weekends. Dining: In the Barrio Historico, try Casagrande for innovative dishes, or Puperia de los Faroles for ambience. For fine views (especially at sunset) and setting, check out La Torre, which occupies an old lighthouse-like tower on the seawall. The best ice cream in town is at Arco Iris on Lavalleja. Daniel Gabriel's stories and articles have appeared in over 200 publications in 8 countries, including many pieces in Transitions Abroad over the past 20+ years. He is also the author of a short story collection—Tales From the Tinker's Dam—about his days as a publican in Wales.